The first step in measuring for blinds is making the decision on where you want your blind to hang. Do you want the contemporary, flush fit of a blind inside the recess, or would you prefer it outside? Think about what suits your interior before you start taking measurements. 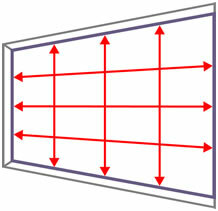 Follow the same approach for the length of the blind, taking measurements at three different points along the window recess - left, middle and right - and provide us with the shortest one. This is commonly known as the recess drop measurement, as it's the length the blind needs to drop when extended – but it still has to be long enough to cover the entire window. Ideally the blind should not obscure the window when it is raised so you may want to consider adding overlap at the top and/or bottom. Like with the width, we suggest adding 60mm to the top and bottom (120mm total) so that there is some overlap on the length. We recommend taking your width and drop measurements in 3 different places, as windows are not always perfectly square, and provide the largest measurement to ensure the best fit. Please note, whether you order recess or exact fitting, the fabric width will always be 35-40mm narrower than the overall size. This is to allow for any control component on the side. We will always take the provided width and manufacture this as the full blind width (not fabric width). If you are wishing to fit one of these blinds outside the recess, you may want to consider measuring wider and allowing some overlap of fabric. When measuring for these blind types, with a recess fitting, please take the width measurement across the top of the window to ensure the best fit. This includes if your recess is tiled at the bottom, as the cloth width is slightly narrower than the overall blind width, so measuring across the top of the window will ensure the best fit. 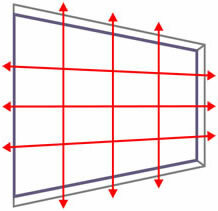 If you are ordering a roller blind to fit inside a recess and wish to side mount the brackets, please provide the measurement across the top of the window and select exact instead of recess, this will enable you to mount the brackets to the inside walls of your recess (Day Night, Vista and Harmony blinds cannot be side mounted). If you have bay windows, for example, they may require a more specific fitting. There are different designs of bay window, such as a square bay, open, splay bay or angled bay, so you will need to be very specific with the size of the blinds you’re measuring for. You can visit our Bay Window guide here. The following table is a guide to the amount we will deduct if you select ‘recess’ measurement. We make these deductions to enable the blind to fit inside your recess so it is important to be precise with your measurements. If you wish to make your own allowances instead and do not require us to make them, please select exact fitting and not recess. For more help with measuring for blinds, or getting a perfect fit, take a look at our simple step-by-step demonstration videos on the best way to approach each individual type of blind. Visit our Video section here. Measuring blinds to fit the windows in your home doesn’t have to be a difficult task. With these simple instructions, hints and tips you will have the perfect fit for your blind. Once you know how it's done, it’s on to ordering a blind that perfectly fits your window and interior. For the option to choose a tailor-made blind in a range of stylish designs, browse our full collection for the perfect finishing touch to your home.